Hutches provide a draught free, weatherproof shelter for other animals too. They are completely opaque and well ventilated to keep your animals cool in hot weather. 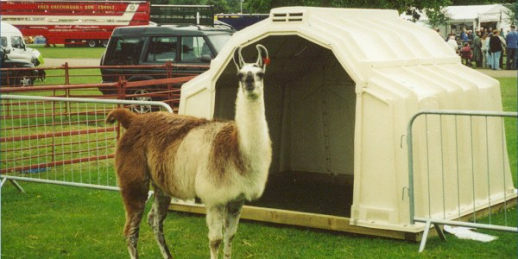 Our customers use MultiMax group hutches for alpacas, llamas, Shetland ponies and groups of goats and sheep. Individual hutches make good shelters for small numbers of sheep or goats, or for housing individual animals if they are ill. The hutches are not suitable for pigs as they chew the plastic. No planning permission is required. Group hutches can be moved easily using a small tractor or telehandler - watch the video here. You can buy hutches for non-commercial use from our online shop. Farmers, and anybody who wants more than one hutch, please phone us on 01327 300 395 rather than buying online. The online price includes VAT and delivery of a single hutch without fences or accessories. We deliver larger orders ourselves with a single delivery charge which will work out cheaper if you are buying more than one hutch with fences and accessories.